Behçet disease, a multifactorial systemic inflammatory disorder of unknown etiology, is characterized by recurrent oral and genital aphthous ulcers, and uveitis as cardinal features, and also other manifestations involving the skin and mucosal tissues, eyes, joints, blood vessels, lungs, central nervous and gastrointestinal systems. 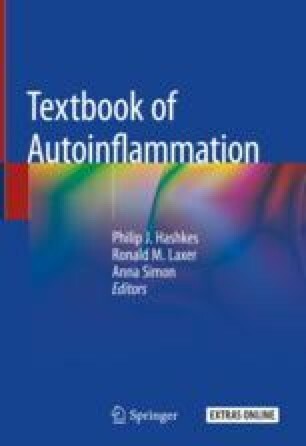 Some of its recurrent manifestations overlap with the clinical findings of autoinflammatory disorders. However bilateral posterior or panuveitis with typical features, variable vessel vasculitis with a preference for the venous side, and parenchymal neurologic involvement as subacute brainstem syndrome constitute its distinctive clinical findings. Behçet disease is strongly associated with human leukocyte antigen (HLA)-B*51, and an epistatic interaction between HLA-B*51 and one of the endoplasmic reticulum-associated aminopeptidase 1 (ERAP1) haplotypes implicate the critical role of peptide-HLA complex in the disease pathogenesis. Additional non-HLA genetic variants associated with Behçet disease contribute to the changes in sensitivity to microbial and other environmental triggers resulting in a hyperinflammatory response involving mainly innate immunity, Th1 and Th17 type adaptive response and endothelial activation. Treatment of Behçet disease is empiric, and should be tailored according to the severity of manifestations. Clinical findings and their recurrences can be managed by anti-inflammatory and immunosuppressive drugs, including corticosteroids, colchicine, apremilast, azathioprine, cyclosporine as well as monoclonal anti-tumor necrosis factor agents and interferon α, and when necessary with other targeted biologic treatments.